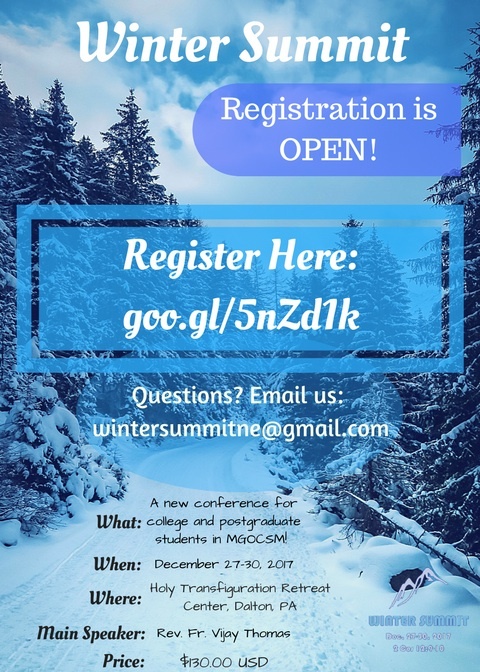 The MGOCSM of the Northeast American Diocese announces a new initiative – The Winter Summit. This overnight conference will focus on the spiritual needs of our college/university students. It will be an avenue for our college students to gather in prayer, and to rejuvenate their spirits before the new academic semester. The Winter Summit will take place from December 27th to 30th, 2017 at our Holy Transfiguration Retreat Center. The Reverend Father Vijay Thomas will be the main speaker, and will present on the theme based on 2 Corinthians 12: 9-10. All interested college/university students are requested to contact their area MGOCSM Council members for more information. Please note, that registration for this conference closes on October 31, 2017. The continued prayerful support for the MGOCSM of our Diocese is solicited from all of our clergy and faithful.